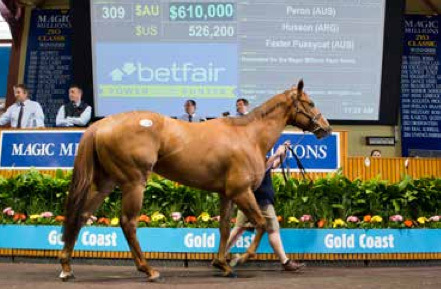 The first day of the Magic Millions Patinack Farm Complete Dispersal Sale exceeded all expectations at the Gold Coast yesterday, although it was a mare fromoutside the dispersal who ultimately topped he day’s selling. 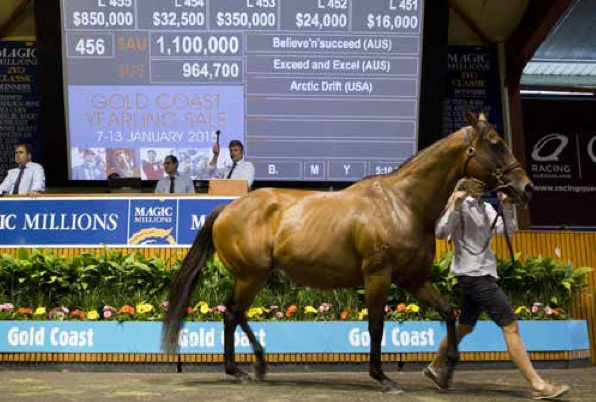 A total of $22,487,000 was spent on an extraordinarily strong day of selling that yielded an average price of $117,733 and it was Tom Magnier of Coolmore Stud who took home the highest-priced lot, going to $1,100,000 to secure Believe’n’succeed (Exceed And Excel) in foal to Street Cry (Machiavellian), who was offered by Attunga Stud as agent for Jynnbrook Birchall Dispersal. Catalogued as Lot 456, Believe’n’succed, who was withdrawn from the Magic Million National Broodmare Sale in June due to illness, won the Blue Diamond Prelude (Fillies) (Gr 3, 1100m) and her first foal is the Railway Stakes (Gr 1, 1200m) winner Bounding (Lonhro). The top class racemare who is also a sister to Darley first season sire Kuroshio (Exceed And Excel) is out of the Gone West (Mr. Prospector) mare Arctic Drift who is a daughter of Joint Top Three-Year-Old Filly of USA November Snow (Storm Cat). “Believe’n’succeed is a quality mare and a proven producer and mares of her calibre are obviously hugely sought after,” said Magnier. Magnier purchased six further lots yesterday, all of whom were part of the Patinack Dispersal, including Danehill Smile (Danehill Dancer), catalogued as Lot 484. Sold holding a cover to More Than Ready (Southern Halo), Danehill Smile won the Canonbury Stakes (Listed, 1100m) and has produced two winners from as many to race including the stakes-placed Danny O’Brien-trained three-year-old filly Feels Like Home (More Than Ready). “We are delighted to have bought some lovely mares today (Sunday) with a nice mix between proven producers and exciting young mares amongst our purchases,” continued Magnier. “It’s always been one of our objectives to breed racehorses of the highest class and with the line-up of stallions we have, the mares we bought today can only enhance our prospects of doing so. “Quality mares are in demand right around the world and that is reflected in the strength of trade today. It was certainly encouraging to see so many people here and bidding so spirited. It bodes well for the future,” he added. Another significant player yesterday was Goldin Farms, who purchased six mares to send to their first season sire Akeed Mofeed (Dubawi), the most expensive of which was the highest-priced mare in the Patinack Dispersal, Bel Mer (Bel Esprit), for whom they went to $850,000. Catalogued as Lot 455, Bel Mer won the 2009 Robert Sangster Stakes (Gr 1, 1200m) when trained by Mick Price and is the dam of two foals to race so far including the winner More Than Mum (More Than Ready). Bel Mer was sold in foal to All Too Hard (Casino Prince) on a 26 October 2013 cover. “Bel Mer has got quality written all over her,” Goldin Farm’s stud manager Andrew Perryman told ANZ Bloodstock News. Goldin Farms purchased five further lots yesterday, including Olonana (More Than Ready) for $460,000, Small Minds (Canny Lad) for $440,000 and Linky Dink (Keeper) for $425,000. Catalogued as Lot 385, Olonana won the Challenge Stakes (Gr 2, 1000m) and is the dam of one named foal, who has raced once. She was sold with a colt foal at foal by All Too Hard. The Australiasian Oaks (Gr 1, 2000m) winning Small Minds was catalogued as Lot 420 and was sold in foal to So You Think (High Chaparral), whilst Linky Dink (Lot 361), also a Group One winner, was sold in foal to Lope De Vega (Shamardal). “Obviously the quality was good and we expected (the prices) to be around the sort of marks that they were,” said Perryman. Winner of the 2013 Hong Kong Cup (Gr 1, 2000m), Akeed Mofeed (Dubawi) was retired from racing earlier this year and is standing his first season at Goldin Farms, which is owned by Hong Kong businessman Pan Sutong, who raced Akeed Mofeed. “Akeed Mofeed is going well. He has excellent fertility results from his first few weeks. It was a bit of a trigger to go and purchase more mares,” Perryman added. Gerry Harvey’s Baramul Stud was also active at the sale and purchased the second, third and fourth highest priced lots from the Patinack Dispersal. Allez Wonder (Redoute’s Choice) was purchased for $750,000, Serious Speed (Royal Academy) for $720,000 and No Evidence Needed (Shamardal), for the same price. The Toorak Handicap (Gr 1, 1600m) winner Allez Wonder was catalogued as Lot 477 and was sold with a bay colt at foot by All Too Hard and a positive test to that stallion this season. She is herself a daughter of the Group Two winner Luna Tudor (Military Plume) and is a half-sister to the Group Three winner Pretty Pins (Pins). Serious Speed was catalogued as Lot 410. Winner of the Thousand Guineas (Gr 1, 1600m) and Group One placed on two further occasions, she has had one runner to date in the metropolitan placed Supersport (Al Maher) and was sold in foal to All Too Hard. A Group Two winner and Group One placed, No Evidence Needed was catalogued as Lot 381 also sold in foal to All Too Hard. She is the dam of one foal to date in a yearling filly by Onemorenomore (Red Ransom) who will be offered today at Lot 577. Segenhoe Stud made one purchase yesterday, going to $610,000 for the Listed-winning filly Peron (Husson), who was catalogued as Lot 309. A half-sister to two fellow stakes winners in Gai’s Choice (General Nediym) and Atmospherical (Northern Meteor), Peron is a six-time winner from 16 career starts and has won almost $250,000 in prize money. Segenhoe’s Peter O’Brien told ANZ Bloodstock News: “We had our eye on her for over a year as she is such a well-bred filly and a beautiful physical specimen. “She has had some issues but is now 100 per cent and will head down to Melbourne for a campaign in the care of Peter Moody. We bought her on behalf of a great client of the farm who has had a long association with the Moody stable. The 191 lots offered yesterday sold for a total of $22,487,000 at an average of $117,733 and Magic Millions’ managing director Vin Cox was happy with the results. 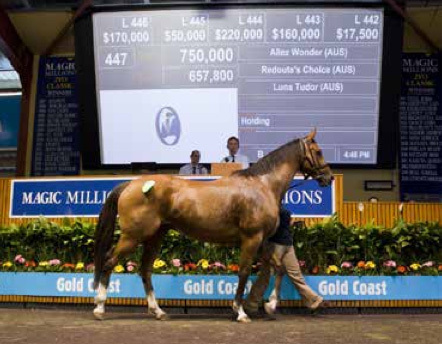 “I am absolutely delighted with the sale,” Cox told ANZ Bloodstock News. “We had strong participation obviously domestically and also internationally and there was strong competition right through from the top to the bottom. Cox is also optimistic about the rest of the week.